"Uhhhhhhhhhhhhh ... sobering up ... 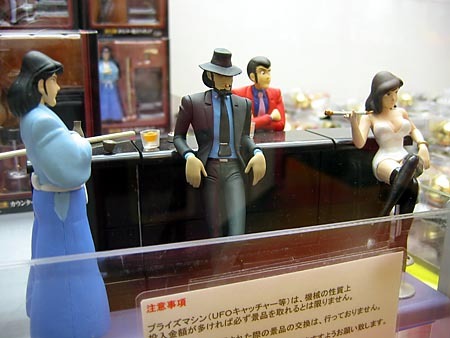 I'm still in this freakin' diorama?" Wait a second ... those are the typing Yazuka brothers! Look out, he's going to shift! Ahhhh ahahahahahaahahahahah ahem. 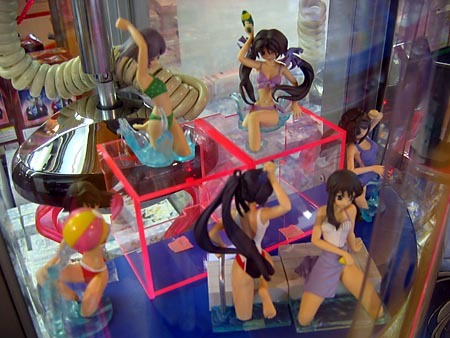 There are a lot of collector figures available as unobtainable crane game prizes. 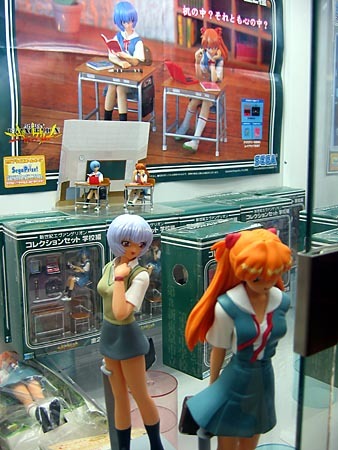 Here are a pair of school girls, who at night transform into international spies dressed like hookers. See? I could be wrong, though, they could just be students who walk around in accidentally-short kimonoes with guns for protection from the typing Yakuza. "Tee hee ... is this how you hold it?" The hands of the young undersexed Japanese male slip on the controls. I don't really know what's going on here. Looks like a missing-limb party. 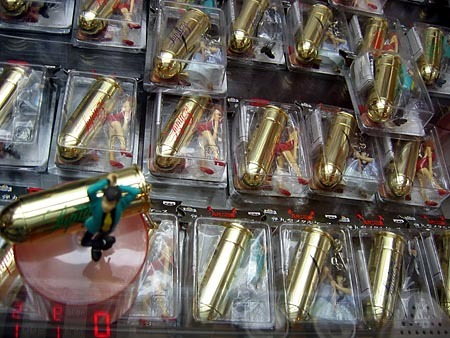 Yakuza typers packaged in sleek bullets. Also note that the figure to the bottom-left is holding a gun in the exact stupid way what's-her-Hookerspy was from two photos up the page. SIR YES SIR! This videogame trains you to fall in, just like a member of the US armed services. 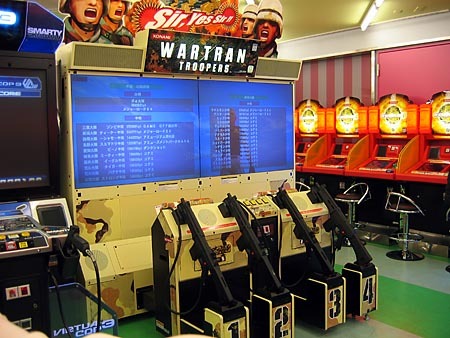 You take your rifle, and march to the drum beats provided by the same drums from Taiko no Tatsujin, but they are not happy now, they are stern taskmasters. High scorers are whisked away to an actual battlefield in a random foreign country, where they are killed, but everyone's totally thankful. 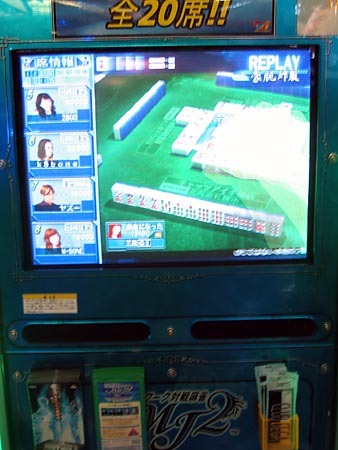 Video Mahjong. I love the concept of Mahjong, but every time I sit down with a set and say "Okay, THIS time, I'm totally going to understand Mahjong," my mind starts drifting off like a tiny flower caught by the wind and sucked into a jet engine. When you walk through Chinatown anywhere USA, you can always hear someone mixing up the Mahjong tiles beyond gated doors that you can't see through because the sun is in exactly the wrong place. It is an excellent noise. I don't hear that Mahjong tile sound. 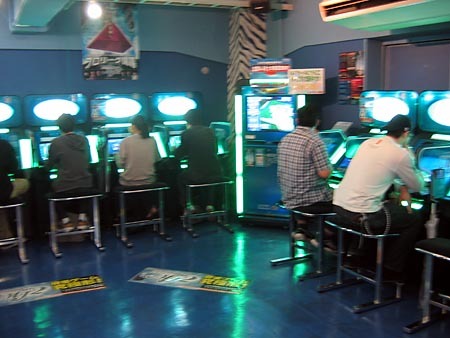 Maybe Namco makes a mechanical Mahjong game.